As usual, great hands for great tries. i love the ref's comment on n.4 : "oh s'il vous plait, on est pas au football hein !" (> "come on, we're not playing football here"). #1 actually was that good. That was just poor defense. I'd have to say was it #9? Where it came off his head? That was brilliant. That try from Julien Tomas was awesome. where the hell was Stade's defense?? the top 14 should have the best tries its got the highest paid players all put together to form super teams. super 14 is predominantly people from each region. and for the record, the french teams have some of the softest tackling backs in the world. its difficult to score tries in super 14 because the backs can tackle. 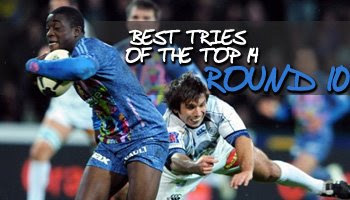 is it just me or are those top 14 tries getting better with every week? Assuming that the try scorer was in front of his teammate, #7 is actually not a try. Should have been accidental offsides, or a offside w/ penalty. "In general play a player is offside if the player is in front of a team mate who is carrying the ball, or in front of a team mate who last played the ball." "Played" is defined as "The ball is played when it is touched by a player." Since it bounced off the teammate's head, it was played. The referee's judgement could have come into play here on several levels. However, he could have referred it to the TMO if he really wanted. It's hard to tell from the video clip if the try scorer was indeed ahead of his teammate. Only one suggestion to uploaders: instead of youtube use megavideo, wuapi, or vimeo; as they provide much higher quality! Response of the uploader : thanx, I'll seriously think about it. But you can go on my youtube page to see this vid on "higher" quality. (I know quality is a still a concept for Youtube).